Over the last thirty years, even as Chinas economy has grown by leaps and bounds, the environmental quality of its urban centers has precipitously declined due to heavy industrial output and coal consumption. The country is currently the worlds largest greenhouse-gas emitter and several of the most polluted cities in the world are in China. Yet, millions of people continue moving to its cities seeking opportunities. 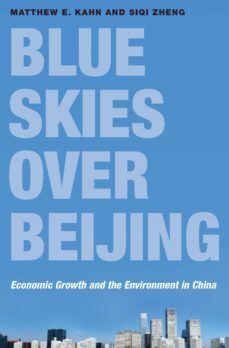 Blue Skies over Beijing investigates the ways that Chinas urban development impacts local and global environmental challenges. Focusing on day-to-day choices made by the nations citizens, families, and government, Matthew Kahn and Siqi Zheng examine how Chinese urbanites are increasingly demanding cleaner living conditions and consider where China might be headed in terms of sustainable urban growth. Kahn and Zheng delve into life in Chinas cities from the personal perspectives of the rich, middle class, and poor, and how they cope with the stresses of pollution. Urban parents in China have a strong desire to protect their children from environmental risk, and calls for a better quality of life from the rising middle class places pressure on government officials to support greener policies. Using the historical evolution of American cities as a comparison, the authors predict that as Chinas economy moves away from heavy manufacturing toward cleaner sectors, many of Chinas cities should experience environmental progress in upcoming decades.Looking at pressing economic and environmental issues in urban China, Blue Skies over Beijing shows that a cleaner China will mean more social stability for the nation and the world.